Part of the pleasure of re-enactment is getting the clothes right. Yes, of course, there’s the materials (don’t even *think* modern alternatives), but then there’s how they’re made. Modern machines put too many stitches in too small a space. Period machines weren’t as efficient and couldn’t do as fine a job. Union uniforms were machine made, Confederate were a mix of machine and homespun. Men in the Confederate Army would show their individuality by sewing colourful patches on the holes in their pants (the trousers were made of wool and quickly wore out). Cotton shirts of bright colours made out of spare dress material by doting female members of the family – again, common with the Confederacy who sought to assert their independence in everything they did – quickly became threadbare, the armpits rotting due to sweat (apparently you could smell the Army of Northern Virginia over a mile away). For this reason, the pits of shirts could be replaced without much effort, the area being made of a separate piece of square material. Jacket buttons were prone to fall off, so the first thing you did was get a large needle and thread it with string, then feed it through the buttons from the back so they were all attached to it, so even if the cotton failed, you didn’t lose your button. Yes, you could grab one from someone else’s uniform on the field, but they probably wouldn’t match, and men were proud of their State affiliations, often shown in their buttons. Hats were quickly replaced. Kepis and slouch hats weren’t good at keeping the sun off and led to burned ears and necks, so Confederate soldiers favoured broader brims (this was also true of the western Union Army). A man’s hat quickly became the way you recognised him. Brogans or Jefferson boots have horseshoe heels to eke out the leather. Without grips they can be lethal in wet or muddy ground (or on modern tarmac and flooring). Overheating is the bigger issue, however, especially in the summer months. Woollen jackets, trousers and waistcoats are hard work in July and August. For this reason, you will see old hands grab a colourful handkerchief, soak it in cold water, then pop it under their hat to help cool them off. Our uniforms will quickly smell of eau-du-campfire (marginally better than stale sweat! ), but they’re as individual on the Confederate side as the people wearing them, and all done using original designs and materials. Sutlers stalls can do it for you (for a price) and old pieces from blanket sales can help keep costs down and ensure you aren’t so obvious a green-horn on the field. The Original Re-enactor’s Market, held twice a year, is a great place to find materials and sutlers stalls. Military Odyssey, which is the biggest multi-period re-enactment event in the world, is held at Detling in Kent on August Bank holiday and boasts several acres of indoor and outdoor sutlers, plus the chance to see the clothes in action. 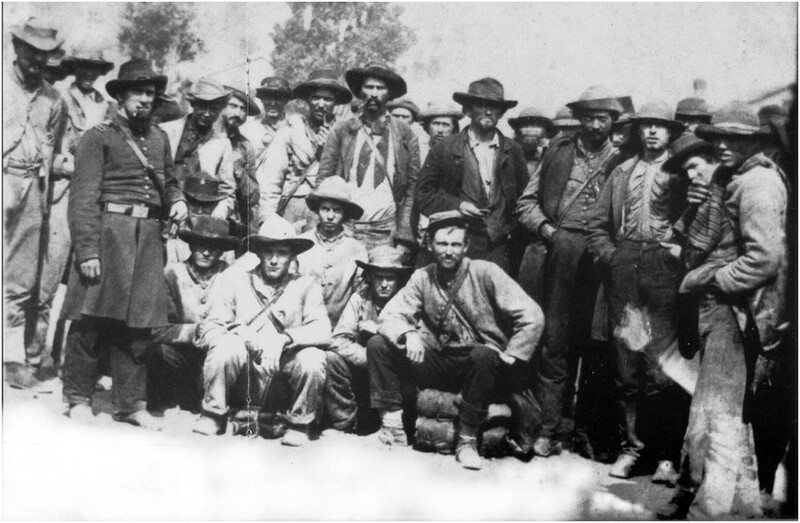 Army of Tennessee prisoners at Camp Douglas, Chicago, Illinois, ca. 1864. Note the mix of hats and uniforms.